After an hour getting a last-minute permit and an hour waiting/riding the bus, I was dropped off at The Grotto shuttle stop. 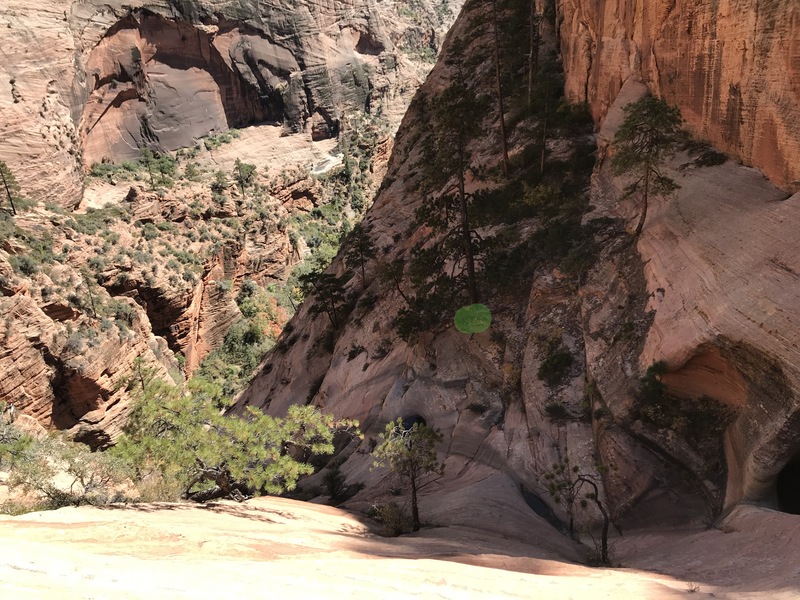 I took to the trail with determination to blow past the hordes of tourists going up to Angels Landing on a cement trail. After the 1000 ft of elevation gain, I was rewarded with an awesome viewpoint from Scott’s Point. 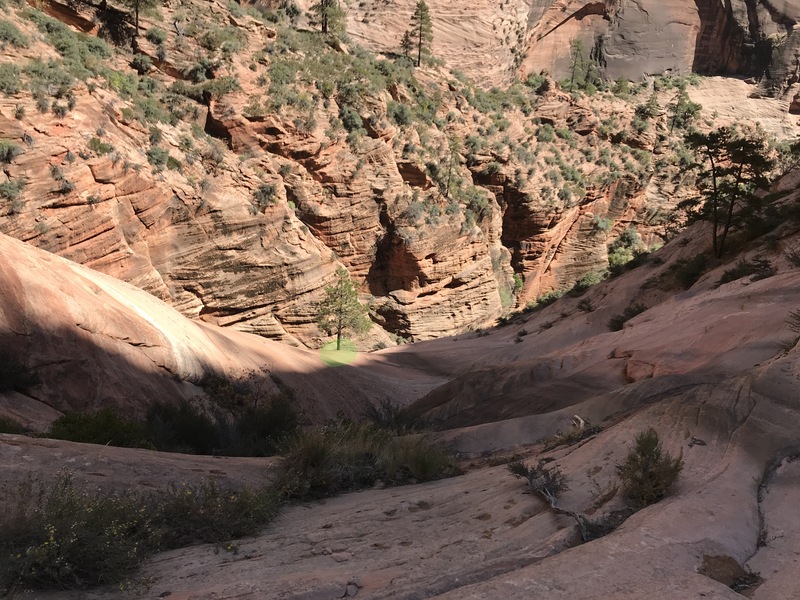 Luckily here I left all these people behind as I turned onto the West Rim trail. 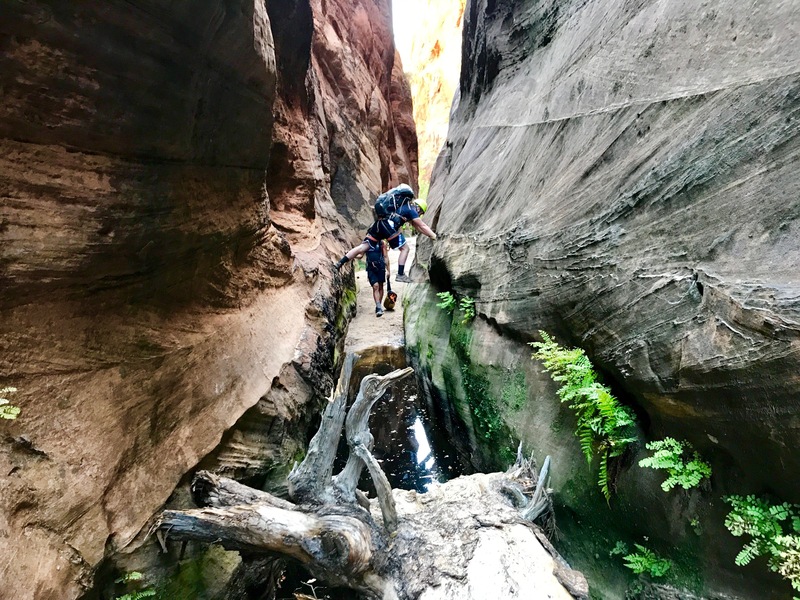 The trail had broken sections of cement the whole way and a few wide open tan sandstone slab sections before it rounded the narrow Refrigerator Canyon on the left. Then it continued to round Mystic Mountain in a U, revealing the beautiful fall colors against the lightly tanned, checkerboard patterns of Mystic. In this U a closer inspection of Mystic Mountain’s features is provided. 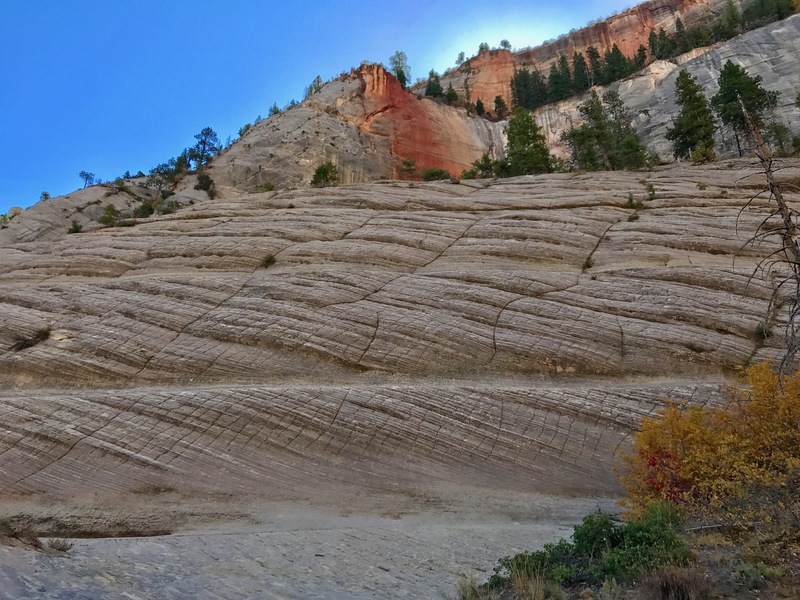 A lattice of cracks interspersed with wide, recessed bands like the centerline of a highway. 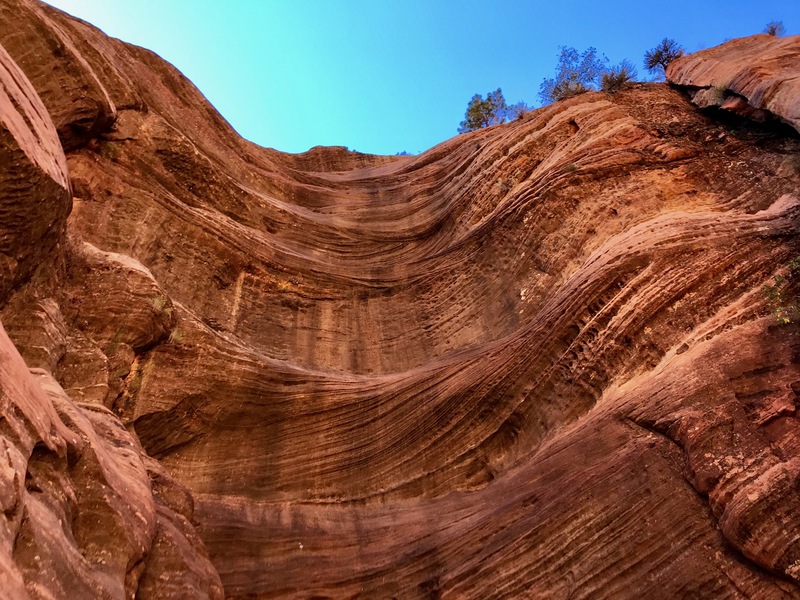 The whole thing resembling a rolling wave of stone captured in time. 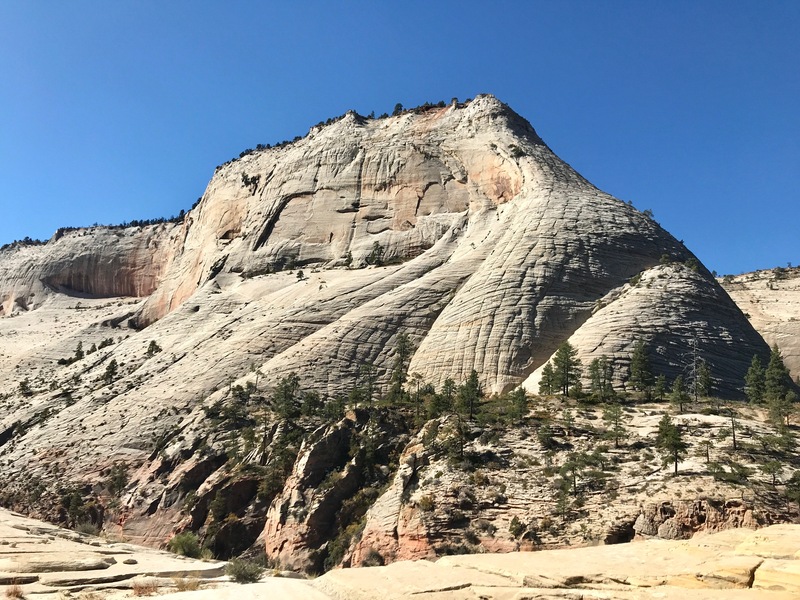 Soon the West Rim trail took me up a small saddle and a clear side trail left Behunin Pass downcanyon across slabs just before the West Rim started switchbacking upwards. Diagonally right from the pass, across the slabs, the canyon is forced downstream by a sheer orange wall of the West Rim. 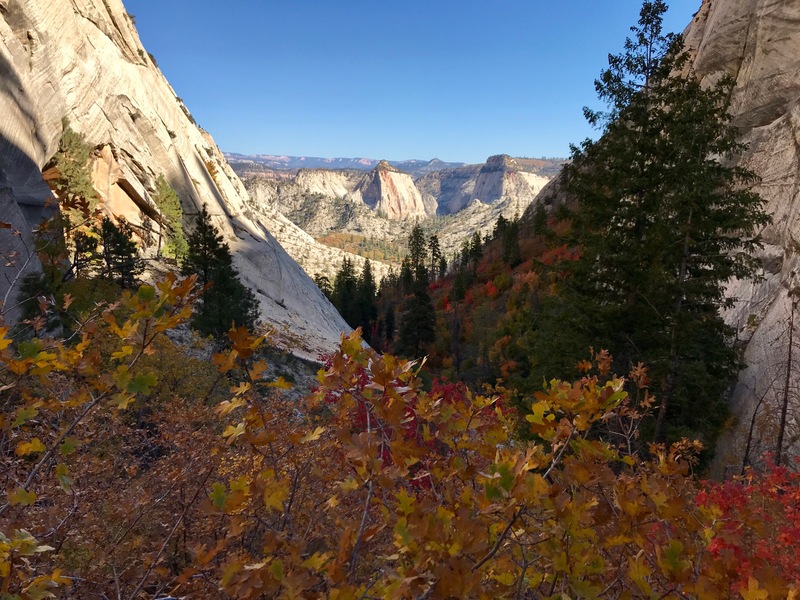 Here I was dropped into brush and fall foliage for a forested mile. 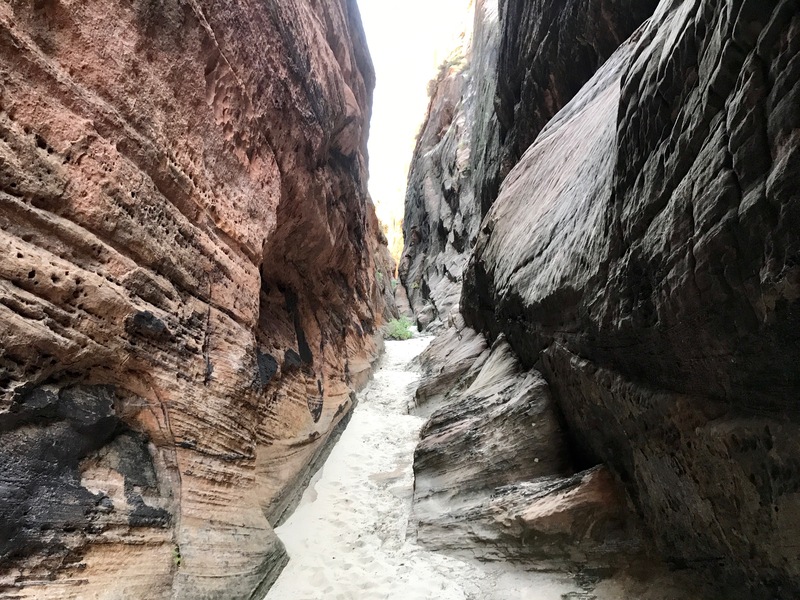 Just before the canyon opened up into a wide smiling slickrock bowl I had to keep left to avoid some condensed goopy pools… Unless that’s your thing. 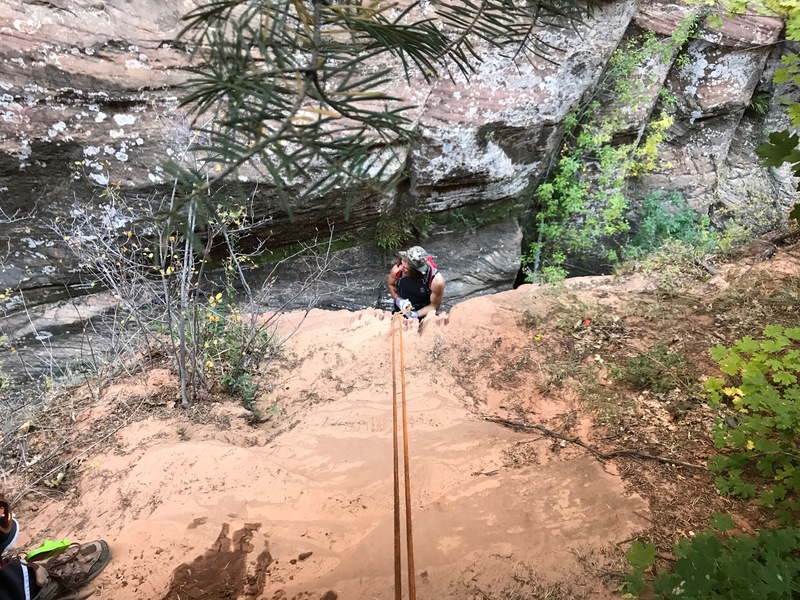 On this slickrock, the first rappel appeared off to my left down low angle slab. The higher one was recommended in the winter if slippery. Next, a large slung tree is rapped down a short drop (above) to the next large tree (below), alone on the lip of the lovely 45m rappel. These first two rappels could easy have been bypassed by downclimbing off the fall line if desired. 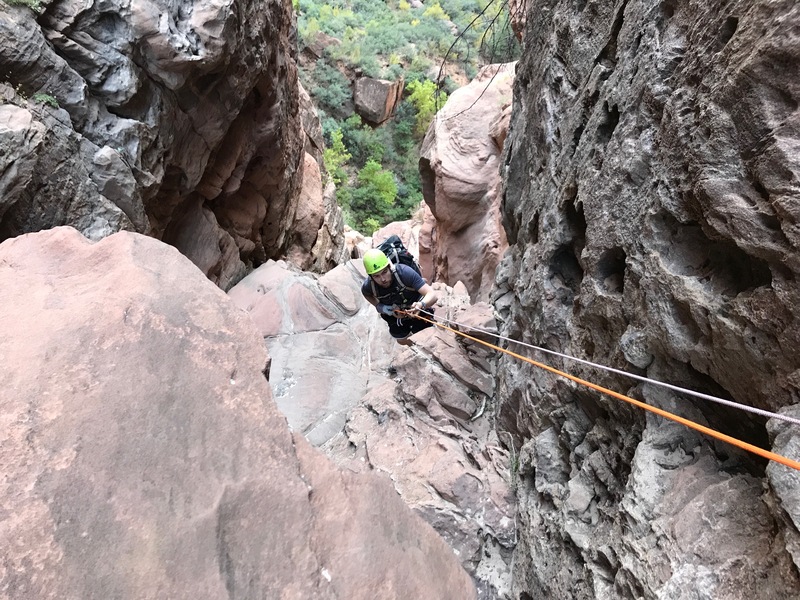 The third 45m rappel, however, was unavoidable. 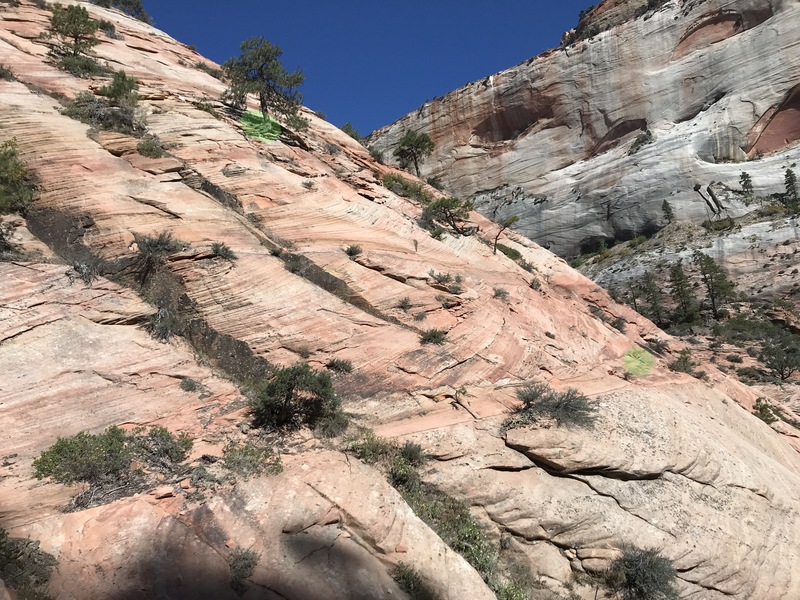 Yielding an awesome drop over a couple steep lips of orange banded slick rock until another short rappel into a small sandy bottomed canyon. 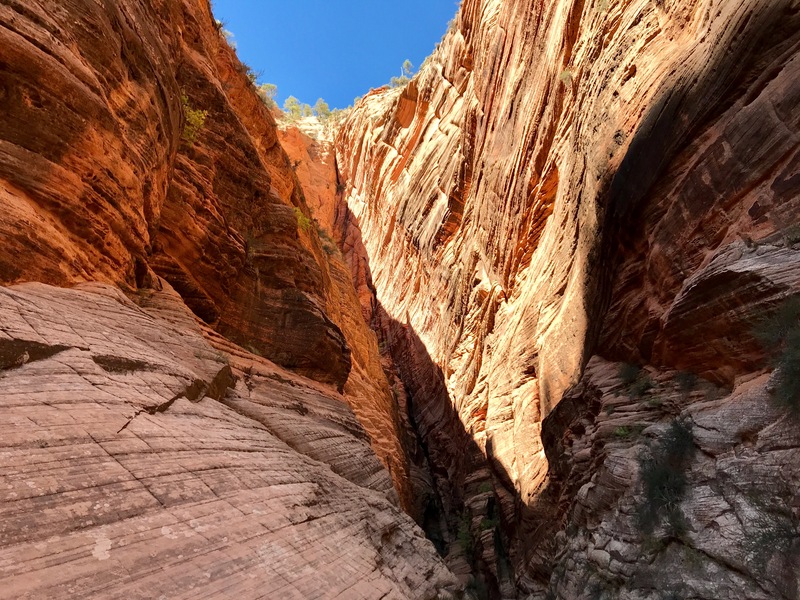 Finally, it felt like canyoneering! View from the bottom, looking up at prior two raps. 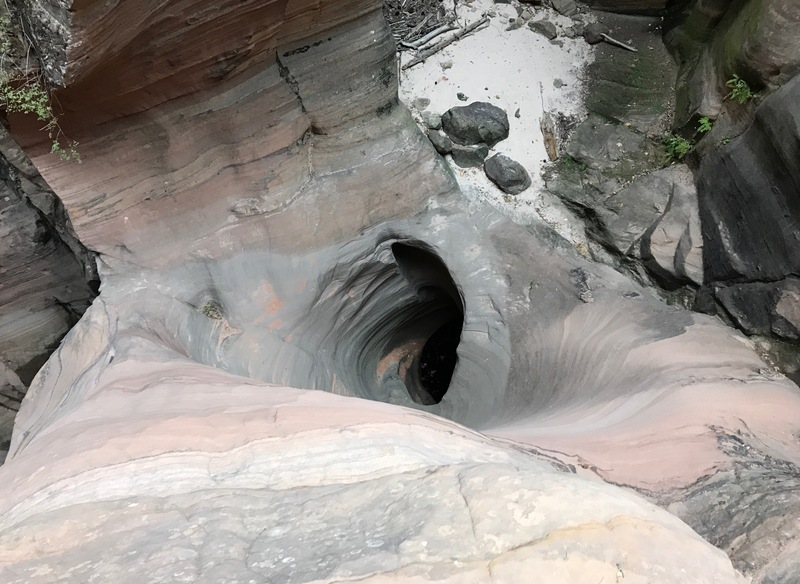 The walls crept in over the 1/4th of a mile until a 5 ft constriction gathered two small pools of water resembling the last cup of stagnant coffee in the maker at the end of the day. 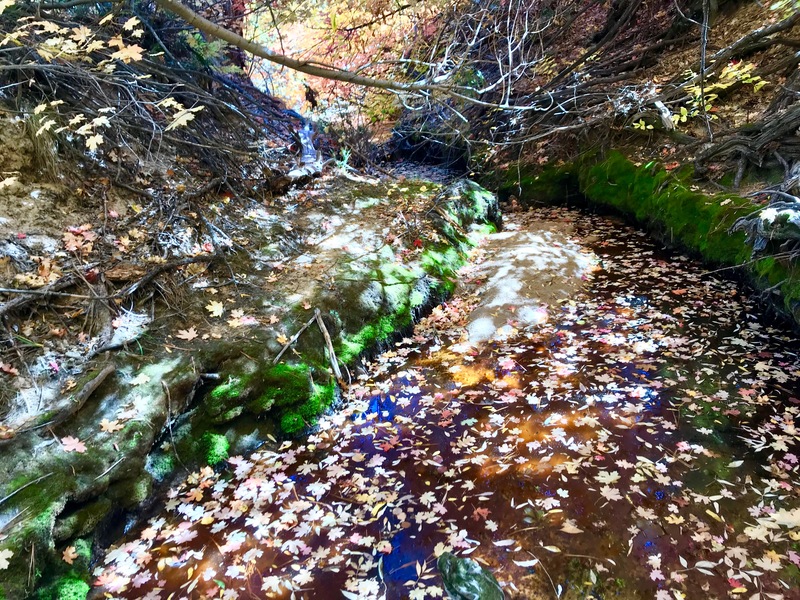 Their density of algae, bugs and whatever rotten things get washed into the water ever-increasing as they shrunk all summer from the warm sun. In this section, I caught up to the party of two ahead of me and we three stemmed across these sections. My lank fully utilized to my advantage as I embodied a log jammed between narrow walls in a flash flood. 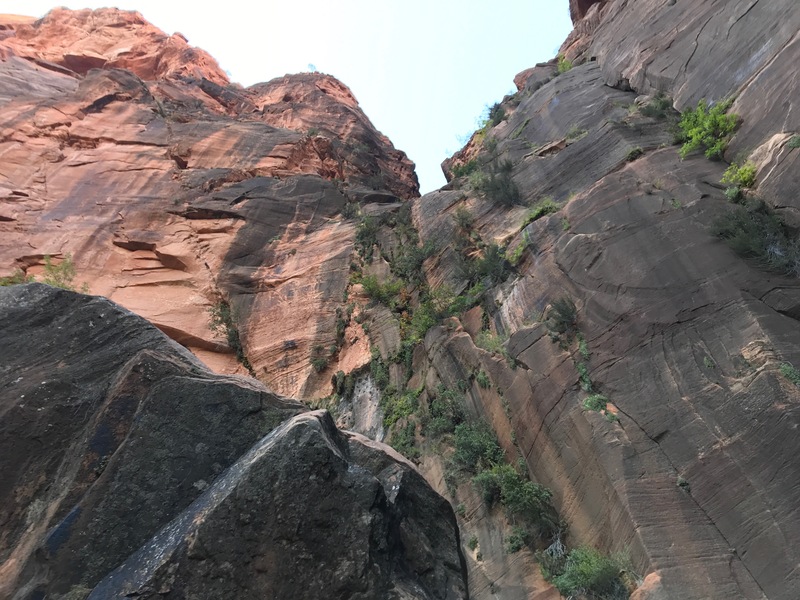 Finally, I rappeled in a dark slot canyon a couple feet wide with featured, black, climbable sandstone on each side. I made sure to enjoy taking in the beautiful form of the swirling 5 ft deep pothole on the right on the way down. 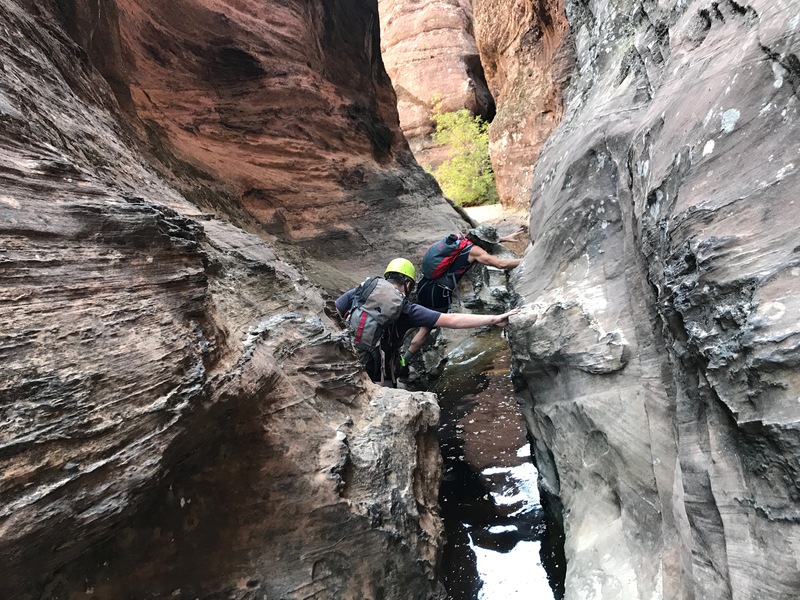 The final rappel was a great end to the day down to one hole and then with a great 10m free hanging section, down to a sandy floor atop the emerald pools. 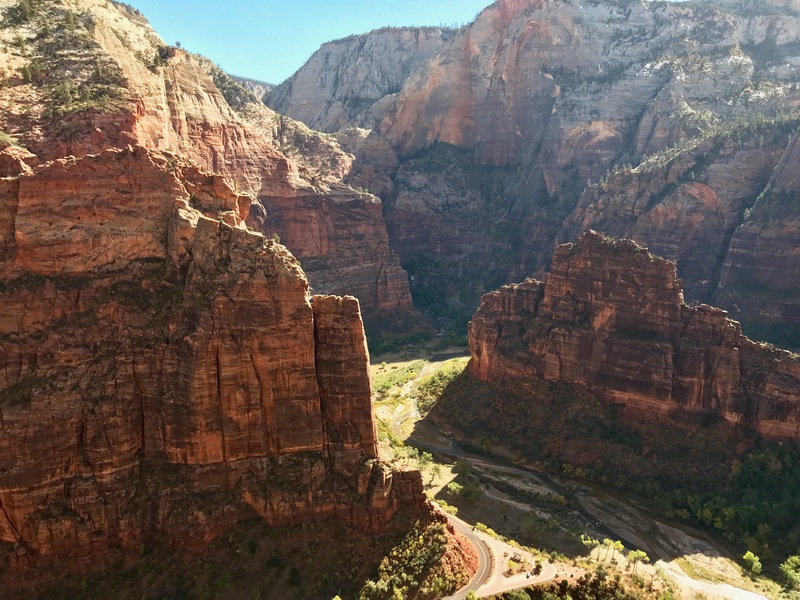 In summary, the canyon is a great, straightforward, dry canyon for a day in Zion. 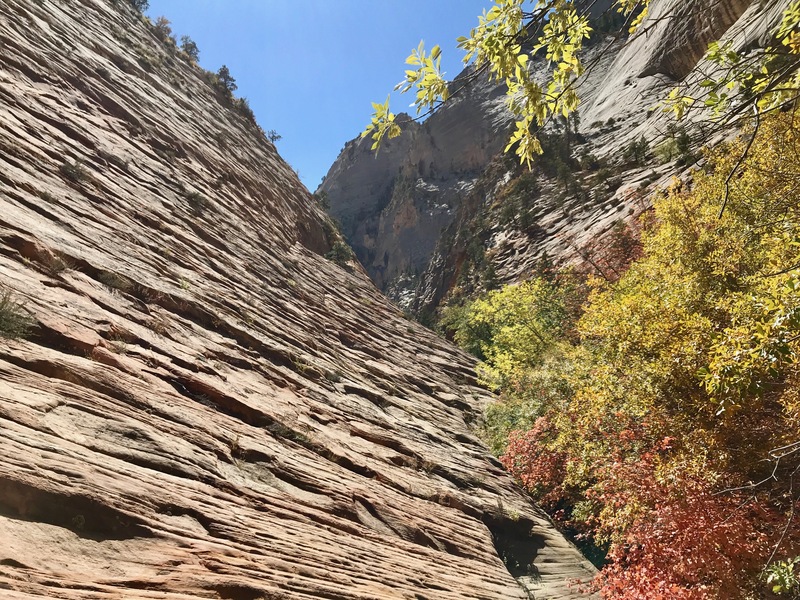 More like canyon hiking with a couple slot sections, but that feels typical in Zion.